Film „Santa Rosa- odyssey in the rhythm of mariachi“ is a history of the Polish war refugees in Mexico, who after being deported to Siberia by the Soviets, found a safe shelter on the welcoming Mexican soil. This practically undiscovered WWII episode is a story of human solidarity, tolerance and selflessness which resonates its universal values with any audience, regardlesss of their nationality, age, social status or education level. „ I am 73 years old and I can easly forget what were we talking about just a minute ago. But what I went through when I was 10, I will never be able to forget. I recall vividly how the Soviets came and arrested us, the journey in the cattle cars to the village near Archangielsk, our everyday fight to survive. All of this is still very painfull. Even now, its hard for me to describe the poverty and filth we had to live in. Sometimes I feel ashamed to talk about this with Americans, because they cannot believe how one can go through this ordeal and still be a „normal“ person. Poles who arrived to Mexico were people, who passed through a horrible life expieriences therefore it was not easy to gain their trust . During 3 year stay in colonia Santa Rosa they we able to recover their faith in other human being and in their own potencials. Watching the film‘s protagonists telling their personal stories, one can only reflect how a person, who lost everything in his life – a home, wealth, family members, homeland and freedom is able to raise from the bottom again. The way locals treated exotic visitors – with curiosity, but at the same time tolerance and understanding of their suffering, allowed Poles regain their own dignity and is an example of humanitarism of Mexican people for entire world to admire. Walentyna Grycuk de Gonzalez, Aleksandra Grzybowicz Villalobos , Franciszka Pater de Luna – Polish refugees who settled in Loen Guanajuato , got married to Mexicans and raised happy families. All Poles who stayed at Santa Rosa refugee camp make it clear that it is their duty to help others, the less fortunate ones. This is their way to pay the debt of selfless help they received from the Mexicans during the war. 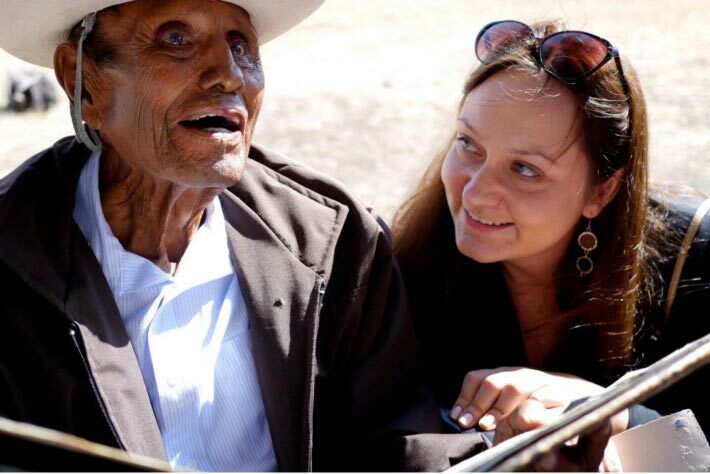 The story of Santa Rosa is presented in the film through the eyes of Joanna Matias – a young Polish lawyer,who takes on a trip to Mexico in search of the grave of her grandfather – Jozef Wiercinski, who died there in 1948 after a short illness. Her grandmother Alina and grandfather Jozef were the first couple married in the hacienda. Soon after her father – Bogdan was born there. 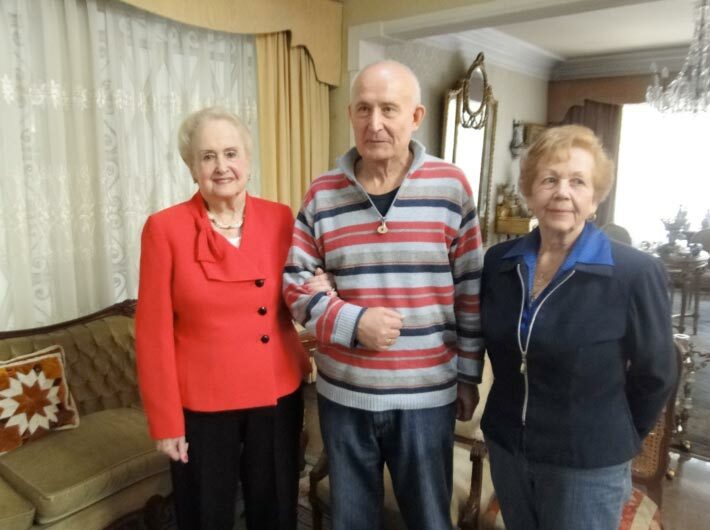 Untimely death of 26 year old refugee ruined the family plans to settle in United States after the war – in autumn of 1948 the widow and her two children – Bogdan and Janina returned to, then communist, Poland. Although Joanna since early age heard the stories of Santa Rosa because her grandmother remarried and the subject of her first husband became a family secret . She always dreamt to go there one day and searched the Internet for any kind of information about Jozef Wiercinski. This is how the filmmakers found her and decided to make her quest to find grandfather’s grave a main plot of their story. 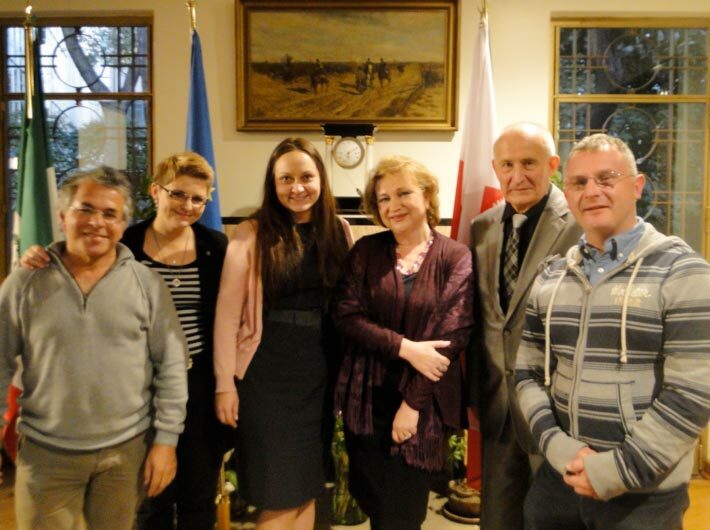 Project parcially financed with support of Ministry of Foreign Affairs of republic of Poland. Both as children they lived in colonia Santa Rosa and later on married. Their lifestory epithomised „american dream” since Chester – an inventor of oval springs used in production of major brands of american cars , after emigrated to US became a president of R.C. Coil Systems Manufacturing Company and self- made millionaire. Małżeństwo. Obydwoje przebywali jako dzieci w Santa Rosa. Po zamknięciu obozu trafili do USA. Ich życie w Stanach Zjednoczonych to spełnienie „amerykańskiego mitu”. Pan Czesław Sawko dzięki wynalazkowi – maszynie do produkcji sprężyn owalnych -podpisał umowy z największymi koncernami samochodowymi i stał się milionerem ( Prezes R.C. Coil Spring Manufacturing Company). Stella (Stanislawa) lost her father and brother in Siberia and as an orphan ended un in colonia Santa Rosa ( she found her mother after the war). Chester and Stella are known for their philantropic activities – they founded the monument of Primate Wyszynski in Czestochowa a school in Leon and clinic for poor in Marfi, Guanajuato. Born in 1931 in Dubno , in February of 1949 she was deported to Siberia, where separated from with her family she was placed in the Soviet orphanage. After evacuation from Russia she transferred to the camps in Middle East and Persia ( now Iran) , where her younger brother died. After miracoulously finding her mother through Red Cross she staied in Santa Rosa with her and older sister – Henryka , who after the war decided to settle in Mexico and married a mexian engineer Rudolf Vargas. 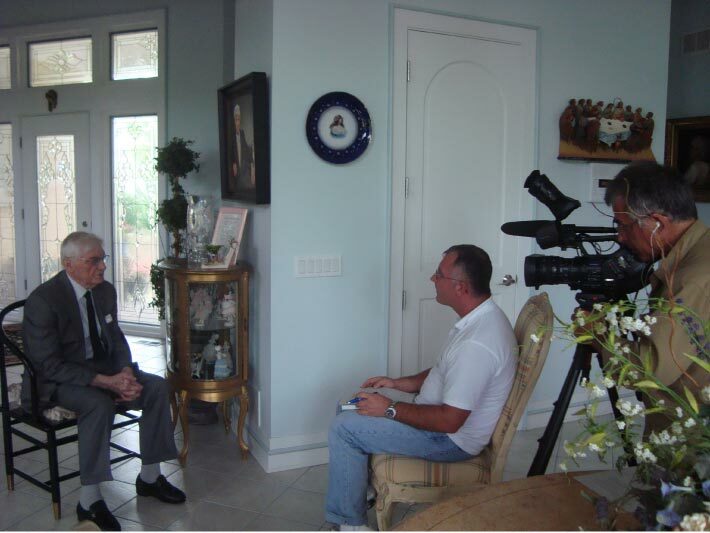 Teresa emigrated to USA where she got married to Tadeusz Sokolowski – AK soldier and prisoner of Dachau and Auschwitz. She raised her family in Polihs patriotic spirit and was an organizer of Polihs school for her children in Chicagoarea where she lives till this day. Born in 1928 in Bratanowice. On the way from Siberia to Kazakhstan her mother got lost and they were never able to find each other again. She came to Santa Rosa as an orphan with her younger sister irena. Lives in Chicago area. Born in 1932 in Dabrowa . Lost both of his parents in Siberia. Came to colonia Santa Rosa with his brother – Eugeniusz. After the war emigrated to USA and settled in Chicago area. Born in 1937 in Grycowka. Separated form ther parents, she came to Santa Rosa at the age of 6 with her grandparents and aunts. On the day of their departure to USA the grandfather died in the car crash. She settled in Mexico where she married a local suitor. At the age of 34 she became a widow with 8 children. In 1970s she found her father who lived in Poland and traveled there to meet him. Lives in Leon till this day. Born in 1931 in Woronucha. While in Santa Rosa she was dating against the will of her parents a local Mexican man , whom she eventually married. She had 10 sons and still lives in Leon, Guanajuato. Born in 1923 in Lanckoronka Klicka. She met her future husband – a Mexican man who spotted her at the train station the day she arrived to Leon. Gave birth to 9 children and still lives in Leon. Walentyna, Aleksandra and Franciszka preserve their Polish haritage and meet once a month to converse in their native language , cultivate traditions and reminiscent on their years spent in colonia Santa Rosa. 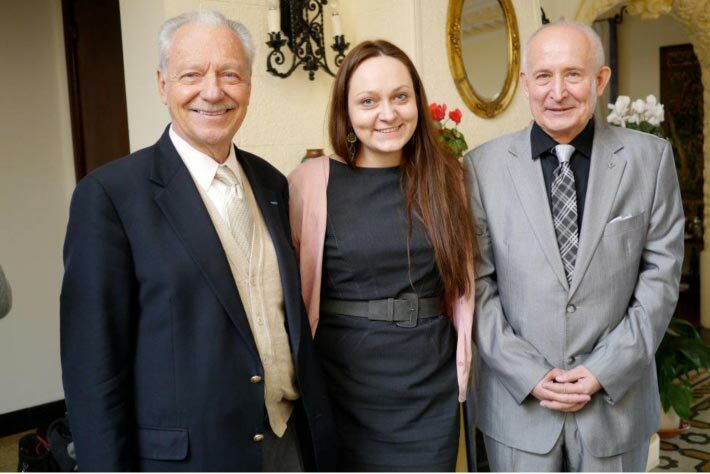 The idea of the documentary film about Santa Rosa was born in the beginning of 2011, when Polish journalist and film producer, who lives in Mexico – Piotr Piwowarczyk, met with Ambassador Niewiadomska, during the screening of one of his documentaries – a story of Polish war heroine Irena Sendler. She suggested he dedicates his next project to little known war episode of Polish war refugees who found safe heavens in colonia Santa Rosa. After yearlong research in archives in Mexico, Poland and USA, the film was produced in 2012 and finished in time for 70th anniversary of arrival of Poles to Mexico, which takes place on July 1th 2013. On September 28 1939 Nazi germany and Soviet Russia sign a treaty on ‘friendship and frontiers” sealing the forth partition fo Poland . Russians are awarded the Eastern parts of prewar Polish territories , while the Germans occupy the west. August 12 – USA and Great Britain sign Atlantic Declaration, vowing the war and cooperation until total victory over Nazi Germany. Autumn – Polish army is being formed under lidership of General Anders. The families of soldiers join them at the camps under care of Polish Red Cross and governement-in-exile agencies. May 1942 – German U –bots attack two Mexican ships in Gulf of Mexico. Mexico joins the allied forces against the Axies States. Spring and Summer – Polish army leaves Soviet territory as a result of international scandal, related to discovery by the Germans in Katyn forrest of remains of over 6000 Polish officers murdered by Soviets in 1940. Stalin breaks diplomatic relations with Polish government-in –exile and the army evacuates from USSR to Iran to join the British forces in Africa. The soldiers are followed by thousands of civilians, including women and orphans. In Teheran provisional camps are formed for the civilians who left Soviet Union. The climate and exhaustion from hunger and diseases takes it toll – thousands of Polish citizens die on Iranian soil. Later on the camps are opened in India where the refugees are transported by the British ships. December 29th- General Sikorski and President Avila Camacho announce during a press conference an agreement to accept on Mexican soil up to 5 thousand of ‘Polish refugees from Asia” . General Sikorski in the gesture of appreciation, decorates president Camacho with the highest Polish medal – Order of White Eagle. Spring – representatives of Mexico, Great Britain and Polish Embassy sign an agreement about establishment in abondonded hacienda Santa Rosa near Leon, Guanajuato, of the refugee camp for Polish citizens. Choosing the place they consider mild climate close to this of Polish Tatra mountains and relative distance from the city, which is supposed to prevent fraternization of the Poles with local population. According to Mexican historians Gloria Careño y Celia Zack de Zuckerman the pact was forced by Americans and British on Mexican government. July 1st – the first transport of 704 Polish refugees arrives to Leon ( second transport of 728 people arrives on November 2nd). Due to unfinished renovations in the hacienda Poles are housed temporarly in the local farm school – escuela granja and after a few weeks, arrive to colonia Santa Rosa which becomes their home for next 4 years. The colony is very well organized with financial help of American government and Polish charity organizations in USA. An orphanage is opened in the old mill building and the compound houses a hospital, laundry facilities, bakery, theatre, pre-school, primary and secondary schools and administration. February 10 –Miguel Aleman – head of Mexican Government and future president pays a visit to the colony. He informes its habitants that the camp is not longer movement-restricted territory and they can start to process their documents to emigrate to other countries or to become Mexican residents. April 23 – Polish and Mexican scouts exchange their official banners. May –Chester Mikołajczyk, as a representative of American government which is providing operating funds for Santa Rosa becomes its administrator. New Polish communist government sends it’s new diplomatic personell to Mexico City and takes posession of the Embassy building. They demand that the camp to be closed and all Polish citizens forcibly deported to Poland. Mexican government refuses such demands , giving refugees a free choice about their own future. September 17 –Manuel Avila Camacho – president of Mexico visits hacienda Santa Rosa. He proposes to all Polish citizens to settle in his country. There was the order from Polish embassy that if the refugees do not vacate the camp by December 31, they should be removed from there by force. At the end of the month the chaotic departures started, very often decisions were not well thought-through and made at spur of the moment. Our offices worked day and night to help the people with the paperwork and make them ready for the departure. Mexican officials issued to the refugees special immigration passports, which were giving them the right to work and live in any part of Mexico. 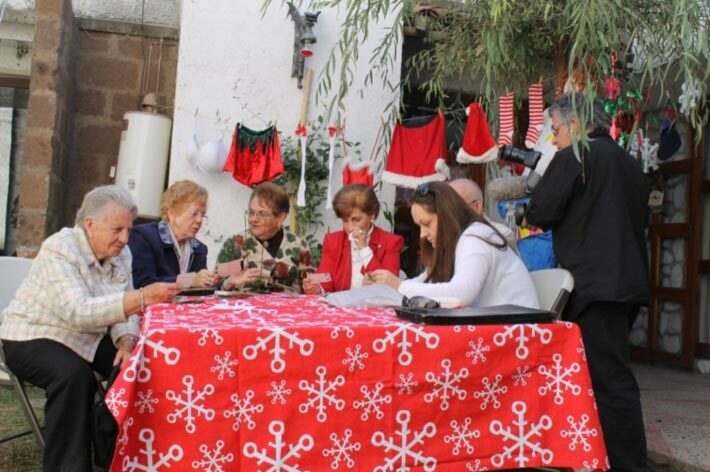 May– a special orphanage for Polish orphans from Santa Rosa is opened in Tlalpan, Mexico, DF. The children attend Mexican schools, but in the afternoons they have religion, Polish and history classes. The orphanage in Tlalpan is liquidated and children are sent to the USA, where they are placed in Polish foster families and catholic orphanages. Franciszka Pater, Teresa Sokołowska, Walentyna Grycuk ,Aleksandra Grzybowicz, Joanna Matias and director– Sławomir Grunberg in the house of Franciszka’s daughter in Leon , Guanajuato. A. Jacewicz „ Santa Rosa „wydawnictwo londyńskie – Veritas , 1967 r.
A. Jacewicz „Na obczyźnie” wydawnictwo londyńskie – Veritas , 1967 r.
I’m thrilled to have found out about this documentary film project as my mother and her family found themselves at Santa Rosa. Although my mother told me that she’d learned Spanish well enough to work as a cashier at the bus depot in Leon I don’t remember her saying that they lived outside of Santa Rosa. My mother’s Polish passport was issued by „Poselstwo Polskie w Meksyku” on May 28, 1948; she crossed into the U.S.A. at Laredo on Jun 4, 1948 and then into Canada at Emerson, Manitoba on Jun 8, 1948, settling in Winnipeg, Manitoba. There were at 9 people from Santa Rosa that came to Winnipeg. Of the 9 my mother and two of her girlfriends are the only ones still living. We, the sons and daughters and grandchildren, number at least 16. My mother attended the 50th anniversary of the closing of the Santa Rosa camp held in Chicago. Please reply to this message as I’d like to share some information I think you might find interesting..
Great news!!! Pozdrowienia z Polski. In the book refugee,s trails by johns Kramek there is a whole chapter on life at colonia Santa rosa as well as other camps from Russia through Iran India,Los Angeles, Mexico and back to USA . Ask for details at jsktrails at msn.com. w Fawley Court kolo Henley w Poaiadlosci Ojcow Marianow. Byla nauczycielka polskiego i nie tylko polskiego w Santa Rosa. Duzo opowiadala o ich wyjsciu z Rosji i duzo o dzieciach sierotach czy pol sierotach w Santa Rosa. Wiem ze wtedy miala pod swoim lozkiem W TEKTOROWYM PUDLE wypracowania dzieci o tym co z nimi stalo sie w ROSJI. Mowila o tym ze byl to rodzaj terapi jaka zatosowala dla tych umeczonych losem dzieci . Czasami wyjmowala te pudla i ze wzruszeniem czytalismy te niesamowite teksty. Po smierci pani Orlowskiej pudla przeszly so Hereforsd posiadlosci Ojcow Marianow z domem dla starych ludzi. Wzial je tam Ks Papuzynski co sie z tymi pudlami teraz dzieje nie wiem. A byla w nich zawarta strasznai historia dziecinstwa tych dzieci. Na pewno ich historia nalezy nalezy do Wielkiej Historii II Wojny Swiatowej. Maryla Podarewska – Jakubowski 01 Nov 2013. This is just amazing. My grandmother (deceased) was a refugee at Santa Rosa but did not share any information at all about her experience. Talking about the war made her shut down and I don’t blame her after learning about her experience starting in Poland. I have been finding more and more information about SR but have yet to locate documents of children born there, as my father was born there May of 1945 (he has some discrepancy of document information after arriving in the U.S.). I appreciate any information. Thank you. I am a polish-mexican american. My grandma was from a small town in Poland, which later on became part of Ukraine. My grandma is still alive and lives in Mexico currently. She lived in Chicago since my mom was born (1957) and later on moved back to Mexico. She is still fluent in Polish, as she made it to Mexico with my great grandparents. Now, she is also fluent in Spanish. Anyways, I thought I’d share this and let you know that I am very intrigued by your project. I’m glad to see that the story is being told. Our descendants were very fortunate to have been given the hospitality of the Mexican people after being deported from Russia. If anyone has any photographs that they can share or know of any, of my Wielgut family that lived in Santa Rosa during this period please do get in contact. Thank you and Bog Zapl~ac.